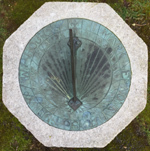 The dial and its limestone pedestal originally stood in the gardens of St. Ann's Academy in Victoria, run by the Sisters of Ste. Anne, a Quebec-based Order. At some point, the dial was transferred to Queenswood, a residence for retired nuns. A replica of the dial has been installed at the original location, see NASS registry entry 572. On the dial: "I MARK NONE BUT SUNNY HOURS". On the surround: "MARJORIE" and "MAY 31 1922". On a plate attached to the pedestal: "EN LAPIS ISTE ERIT VOBIS IN TESTIMONIUM. JOSUE XXIV" and "THE SHAFT OF THIS DIAL IS BUILT WITH STONE TAKEN FROM THE RUINS OF THE BASILICA OF STE ANNE DE BEAUPRE QUEBEC DESTROYED BY FIRE AD MCMXXII"
This bronze dial is a memorial for Marjorie Napier, who died May 31, 1922 at age 12.